This is actually the first graphic novel that I've read in a long time. In fact, it's the first one I've ever reviewed here on this blog! I'm going to have to step back into my graphic novel loving shoes. Let's give it a go! First let's talk illustrations. I Love Him To Pieces keeps it simple, with black and white illustrations. The fantastic part about this graphic novel is that the illustrator has put so much detail into each panel. From the classroom where Jack Chen first meets Dicey, to the baseball diamond where they decide there might be something more in store for the two of them, the illustrations are fairly intricate and gorgeously done. Each panel draws your eye in and keeps you interested in the story line. Also, if you're a fan of zombies but not a huge fan of gore, this graphic novel will suit your taste. The illustrations definitely have the zombie vibe, without the over the top gore factor. Story wise, there is quite an adorable romance mixed up into this zombie filled ride. Dicey and Jack Chen are on two opposite ends of the spectrum. A baseball playing jock, and a science loving nerd. How can the two of them mesh? Honestly that is the best part of the graphic novel, is watching the way these two characters interact. Dicey is extroverted and a take charge girl, which the illustrator and author depict perfectly. Jack on the other hand likes to hang outside the radar and think things through. The two of them are constantly sniping at one another, and it is hilarious to watch. It's an sweet and awkward romance that you'll find. That, and a zombie apocalypse. I won't go any further, since I want you to give this graphic novel a try and a great way to tempt you is to keep you guessing. 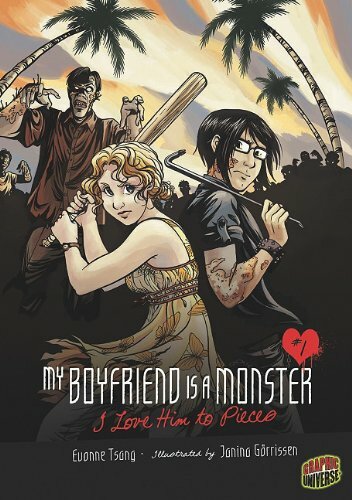 I Love Him To Pieces is a part of the My Boyfriend is a Monster series, and I cannot wait to see where this goes. If you aren't much of a graphic novel reader, this might be a great place for you to start. The story reads a lot like a normal book, just with the addition of fabulous illustration panels that catch your eye and draw you in. I highly recommend you check this out. FTC Disclosure: I received a copy of this graphic novel in exchange for a fair and honest review. I was not monetarily compensated for my opinion.